Hove Town Hall was opened on 13 December 1882. It was designed in Victorian Gothic perpendicular style and cost £50,000 to build. The first image here shows it in the beginning of the twentieth century. The second image shows the building a few months before the terrible fire which began in the early hours of Sunday 9th January 1966. 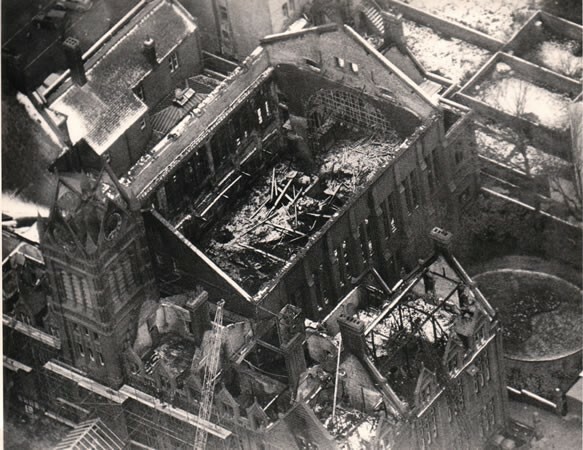 Photograph number three shows the major damage that was the result of the fire which eventually led to the demolition of the building. 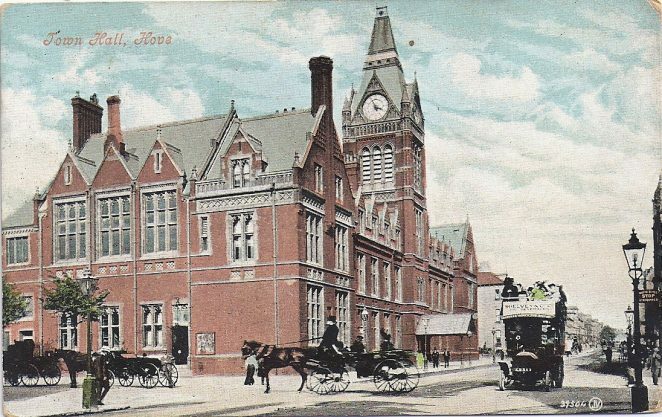 You can read about the history of Hove Town Hall here. 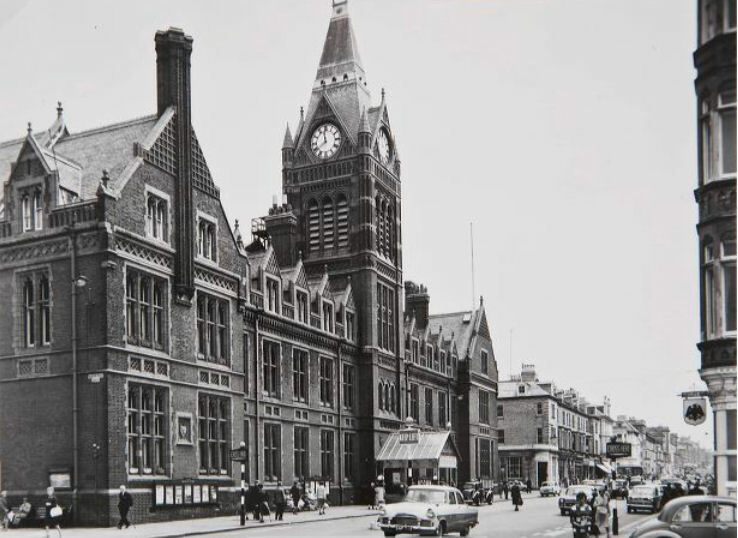 Can you remember the old Hove Town Hall? Did you attend a function there or go to a concert and listen to the great organ? Do you remember the awful fire? If you can share your memories with us, please leave a comment below. I remember the story going round the following morning after the fire, “did you hear, the Town Hall has burnt down?” and then a lot of us kids (I was 12) from Hangleton, walked down to have a look. It was the same when the Bedford Hotel burnt down. The only time I went to Hove town hall was with my school, St. Bartholomews juniors. I seem to remember it was after school. We were taken there for a special Commonwealth exibition in the late 50s, I found it very interesting but, what happened to the Commonwealth? We learned about the other countries & what we imported & exported, & of course where these countries were. I only learned about the fire from this website, another lovely building gone. Like Peter Groves, we heard the news about the fire and rushed down from Mile Oak to take a look. It was very sad because the old Town Hall was a beautiful building. The “new” building was always a concrete monstrosity in comparison. To the side of the old Town Hall, in Norton Road, there were ladies and gents toilets, with a raised gents sign between the two. I’d stand in front of the ladies sign at the top of the stairs, and watch in amusement as the gents trooped down the stairs to the ladies loo. The gents of course, were beyond the raised sign. I grew up in The Drive, one block over from the Town Hall and passed it every day. I remember attending Jumble sales, flower shows, I once bought some finches at a Bird Fanciers show (the cat ate them) but the the best was (as it was called then) All In Wrestling! Regular wrestling programs were held at the Town Hall in the early sixties and although I was too young to attend the hand bills were free and I collected a new one every week, my favorite and most regular performer was the masked Doctor Death! What a dramatic night it was when my Grandmother who lived on the top floor woke us up at 2am, “The Town Halls on fire!” We watched the flames consume the top of the clock tower from the comfort of home (it was winter). To this day the smell of Oak chips smoking on a BBQ reminds me of the Hove Town Hall. I should note that the clock chimed so loud and on a regular 15 min schedule that you always knew the time. I remember this beautiful building very well, having sung with the Hove Girls’ Choir there accompanied by the famous Sir John Heddle Nash and Owen Brannigan. Others might remember the crowning of the London pearly Kings and Queens that we sang at yearly. It had a frequently used dance floor. Just got round to looking at the site. Fascinating. I was a sub-officer at Hove and in charge of the pump. My opposite number was Alec Watts. Alec was oic of the Pump escape. Alec used to do jobs at the town hall when off duty and he knew the layout like no other. The caretaker and his family lived above the offices and was trapped. Rescue was the main priority and the whole family was rescued using the wheeled ladder. A rarity as it was unusual to get such good access. Another fireman there was rookie George Hammond. He had just come onto our watch from training school. George went on to become the Assistant Chief Officer of East Sussex Fire and Rescue Service. A night to remember. A fantastic picture of the fire at its height appeared in the Evening Argus. I used it later for a number of exhibitions.